Bruce Bomier is Board Chair of ERC. He has degrees in Public Health / Epidemiology and Forensics and has published extensively in the areas of public health and environmental policy. He also founded one of the major environmental engineering firms in the Midwest, the Institute for Environmental Assessment (IEA), and served as its CEO for many years. (See www.ieainstitute.com.) Bruce was also appointed by three successive governors to serve on Minnesota’s Environmental Quality Board and for several years provided environmental and humanities commentaries on Public Radio. In 2007, he retired from his engineering company to serve as Board Chair of ERC. Tom Anderson, Board Secretary, was a communications business executive who felt a need to contribute time to social issues. Tom’s business acumen and his experience in finding solutions to technical problems have been fundamental to ERC. Now retired, Tom devotes much of his time to supporting the activities and projects of ERC. Bryan Brown, Board Treasurer, is former City Attorney for Duluth, Minnesota, and has worked with ERC projects and programs for decades. 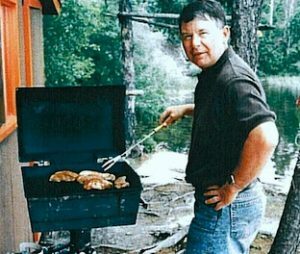 While representing Duluth, he served on a number of boards of highly visible institutions, including airports, utilities, and recreational areas. Bryan received permission from the Duluth City Council to simultaneously serve on the ERC Board as a director. Bryan commits substantial time toward ERC projects, particularly involving legal issues and interpretation of government environmental policy. Clark often did the cooking at our board meetings. Clark Bergloff was an inspired educator with the Mora, Minnesota, School District. Although a highly successful football coach, he always said that teaching was the focus of his professional life. As one of ERC’s founding advisors and board members, his commitment will always guide our mission and values. At Clark’s funeral in 2004, which was held at the 50-yard line of the Mora High School football stadium, his relationship to ERC was described as important in his life. ERC board members participated in the service, reading poetry relating to the environment that had been inspirational to Clark. Clark’s quiet commitment to enhancing our ecosystems always motivated ERC, as did his conviction that providing young people with the right direction and education could help solve our most serious problems. 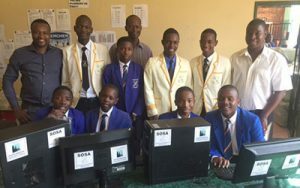 In Clark’s memory we have established the Bergloff Cyber Shungu Project which is donating computers to a private school in Zimbabwe which will greatly benefit the students and provide them with cyber technology. 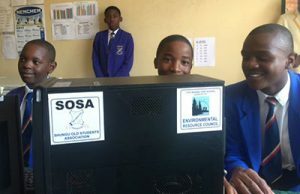 The students and faculty are extremely grateful and, although it wasn’t requested, they have placed our ERC logo on all their computers. They are great kids with a great future and Clark would have been proud.